Life of Pi is a fantasy movie which is adapted from a novel written by Yann Martel. It tells about the survival of a teenager named Piscine Molitor Patel or Pi in the middle of the sea for 227 days with a tiger named Richard Parker. 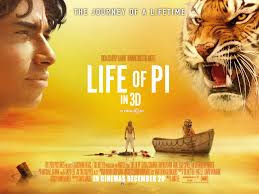 The movie runs when a reporter is interviewing the adult Pi about his life, especially his unforgettable moment in his whole life which is his 227 days of survival in the middle of the sea with a tiger itself. In the beginning of the movie, it shows the introductory of Pi; how he got his unique name, how his friends were bullying him because of his name, how he got curious about religions (Islam, Christian, and Buddha). After that, Pi tells the reporter how the most unforgettable moment of his entire life begins. It was started when his dad, a zoo owner, told his mom and him that he decided to sell all of the animals that their family owns and move to Canada. So, they took a journey to Canada and brought all their animals on a sea voyage. All of a sudden, in the middle of the journey, there was a storm followed by a shipwrecking. Fortunately, Pi was able to survive. He got a lifeboat with some animals of him, but one by one, his animals left him but a tiger named Richard Parker. The tiger won’t to live together with Pi on a lifeboat, so Pi made his own wooden boat. Every day, he needed to feed the tiger with fishes. Because of that, he got a connection with the tiger. He was getting closer to the tiger day by day, but he lost the tiger after they reached an island. The tiger went to a forest and left Pi alone. Pi fell into the sand and cried until people found him and took him to a hospital. One day, people from Japanese Cargo Ship visited him in the hospital and asked every details of the accident until his 227 days survival in the middle of the sea. He told the truth but people thought that he was lying so they plan to visit him again later. On their second visit, they asked the same questions to Pi and Pi told a lie story to them in order to make them think that he did not crazy. For me, Life of Pi movie is not only interesting, but also unique. I said it interesting because it shows us a spectacular story which also contains some moral values. The first moral value that we can take from this movie is do not be afraid to figure out something by our own way. This can be seen in the scene where Pi tries to find out about God and the meaning of a friend. When someone only has a religion, Pi has three religions and when other people is afraid to get closer to a tiger, Pi tries to get closer to a tiger and want to make a friend with it. Second, do not ever give up and face all the problems you have patiently. If we do that, perhaps we can have a happy ending like Pi’s as he said on his scene, “You might think I lost all hope at that point. I did. And as a result I perked up and felt much better”. Besides that, this movie is also unique because we can get two main points from the story of the movie. First, we can see the struggle and persistence of survival which done by Pi and the second main point is how someone tries to figure out about God and religion. This two main points are related each other so that maybe some of us does not notice about it. For me, these two main points that mixed together is a good combination which makes us enjoying the movie until it is finished.